Kooijman, S. A. L. M. 2015. VU University Amsterdam, 8 Mei 2015. In this national farewell address I review my aims of 30 years of professorship and evaluate the impact of my work. As Theoretical Biologist I wanted to contribite in a fundamental way to transform the discipline of biology to a style that is standard in modern physics. DEB symposium 2015, University of Marseille, campus Luminy, 29 April 2015. In this international farewell address about 35 years of research on Dynamic energy Budget theory, I review the ontogeny of the theory, and discuss background, motivation, start, milestones and outlook from a personal perspective. The effort is framed as a case study in Theoretical Biology. 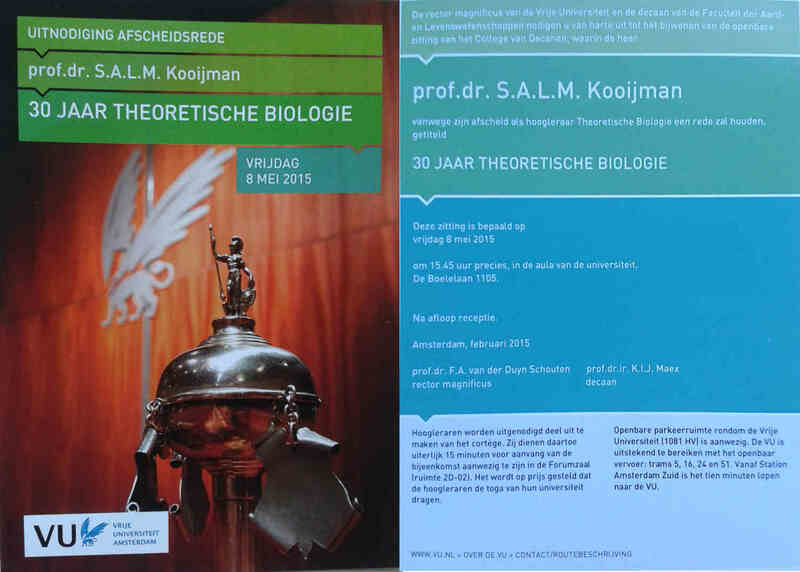 In my inaugural lecture of 30 years ago, I present my views on Theoretical Biology, and detail my aims and plans in education and research. I am still behind those views and actually realised all the plans.